Add the milk or coconut milk and almond milk to a medium sized sauce pot and bring to simmer. Add all of the ingredients except for the nutmeg. Stir and allow to simmer for a minute. Turn off the heat and let steep for 20 minutes. Strain the tea with a mesh strainer into a teapot or something that will allow you to pour it easily. Press the remaining ingredients against the strainer with the back of a spoon to squeeze any remaining liquid out of it. 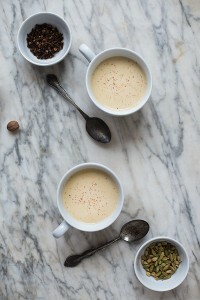 Serve the tea with a light grating of fresh nutmeg over the top of each serving. You can also refrigerate it and reheat it or serve it cold. If serving cold just serve it in glasses with ice and grate fresh nutmeg over the top.